Promote safety, independence, and dignity with an accessible bathtub from Bathway. Accessible bathtubs improve quality of life for the elderly and anyone suffering from a mobility issue. By converting a traditional tub into a walk-in shower, you can calm anxieties around slipping and falling while getting into the tub. Creating a more accessible bathing experience in a home can be done in a short time frame with minimal inconvenience or cost with a cutaway process. A section of the tub is cut down to allow everyone to enter and exit the shower safely. A cap is placed on the cutaway section to ensure your bathroom decor continues to look neat and attractive. Let's explore some of the many other benefits accessible bathtubs are offering to users. More than 70% of all major accidents in the home occur in the bathroom. Accessible bathtubs provide a clear advantage when it comes to the safety of individuals getting in and out of tubs. Walk-in features make bathing and showering much easier for those with mobility issues, preventing users from having to take large steps into a possibly slippery tub. Additional accessible bathtub products include handrails, seats, floors made from skid-proof textures, and pads, which can help users feel secure when showering. Many who suffer from joint and muscle pain or any number of physical limitations face daily hardship and anxiety for the simple task of bathing. Accessible bathtubs can make a world of difference in one’s ability to remain independent. Improving accessibility in the shower/bathtub also allows those with mobility issues to maintain their dignity and remain both comfortable and safe within their homes. 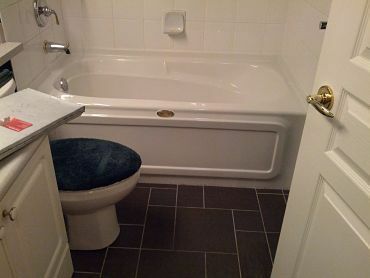 You can convert your existing bathtub into an accessible bathtub easily and affordably by cutting down the outer edge. This change can be done in a single day without the mess, time, and cost of a full bathroom renovation. Why choose a cutaway as your accessible bathtub option? For many people, lowering themselves into a tub to sit is not an option due to aging, disabilities, or other physical limitations such as arthritis. This motion can be harmful as it causes strain on joints and muscles as a person bends. Taking a shower becomes equally challenging and unsafe when a person has to lift their leg over the edge of the tub. A full tub of water is also a safety hazard for the elderly and disabled. If a person were to pass out or suffer an injury in which they couldn’t keep their head above water, a full tub of water could cause drowning and be fatal. Walk-in bathtubs with doors are vulnerable to water leakage as tub doors become less water resistant over time, and if a person were to open the door before the water had all drained out, water would spill out onto the floor. A cutaway tub is a timely, affordable, and easy to maintain option for an accessible bathtub. Full bathroom renovations can be costly. If you’re looking for a cost-effective, reliable, and safe accessible bathtub, look no further than the professional and compassionate team at Bathway. Bathway is dedicated to providing helpful, in-home solutions to those with disabilities and mobility issues. Bathway’s bathtub to shower conversion process can transform your existing bathtub into a safe and accessible walk-in shower, in just over an hour! For more information, contact Bathway today. "I just wanted to thank you again for the great service provided by Bathway. The installer was just fantastic to deal with and the residents are all very happy with the work. Thanks again." Accessible bathtubs improve quality of life for the elderly and anyone suffering from a mobility issue. By converting a traditional tub into a walk-in shower with Bathway, you can calm anxieties around slipping and falling while getting into the tub.